My stay at the Abadia was absolutely lovely! Located in a very walkable area of the city, the hotel is close to many food options, shopping, and historical sites. The staff was welcoming and kind. The room itself was spacious, well-kept and clean. I had all of the necessary amenities and was very comfortable during my stay. It was also quite close to the bus station, if you're traveling to another part of Spain. I had an amazing stay in the hotel. The hotel was clean, the beds were comfortable and the staff was super friendly. Super experience! Very nice quirky hostal to stay in. We loved our stay at Abadia. We were lucky to book it before the high season started so the value for the money was a great deal. Their courtyard is so beautiful and one that takes you by surprise since you can't see it from the outside. The room we had was a bit dark since it was on the 1st floor and in the corner, but otherwise it was very clean. There's no breakfast included as they don't have a kitchen so I can recommend it only for short stays. It's a good pick for a couple though! Its definitely a hotel and not a hostel, so if you're looking for a social place its not for you. Its very clean and comfortable. Staff were very friendly and the hotel is in a nice area. I liked it a lot. Abadia was a great hostel, more like a hotel really. There is no kitchen and their fridge is closed at night. Very quiet place to stay! :) The terrace looks great but couldn’t be enjoy since it is quite cold in winter. Great help from the friendly staff! The reception staff excellent; they’re very helpful and speak perfect English. 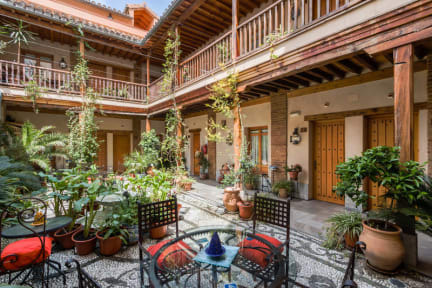 The hotel is situated a mere 15 minute walk away from Granada’s famous tapas bars. Highly, highly recommended. 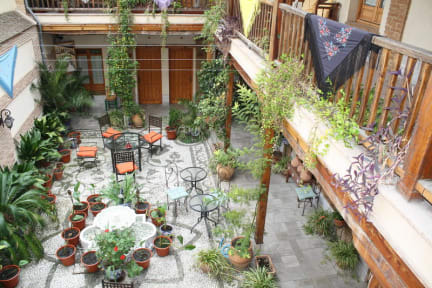 Nice, quiet hostel with helpful staff, and a pleasant courtyard to sit in. It is not located right in the center of the main tourist area, but the sights are only a short walk away, and the hostel has a mini-supermarket and lots of good, reasonably-priced local bakeries and cafes on it's doorstep. quiet location a bit away from downtown, but convenient to taxi stand. After staying in two hostels it was nice to have a room to myself. Abadía is nice and quiet and only a short walk from the center of Granada. However I did have some issues with my shower, and my sink started leaking on my last night. It’s also not a great place to meet people, unlike other hostels.